number of flow regimes that show some geographic clustering, referred to as a "hydroclima-tology'' or "hydrogeography." Based on a large number of descriptors of flow variability and predictability, Poff and Ward (1989) identified ten distinctive flow regimes within the United States, including seven permanent and three intermittent stream types. Examples include the highly predictable snowmelt regime of the Upper Colorado River; the stable flows of groundwater-fed Augusta Creek, Michigan; the winter rainy hydrograph of McKenzie Creek, Oregon; and the relatively continuously variable Satilla River, Georgia (Figure 2.13). 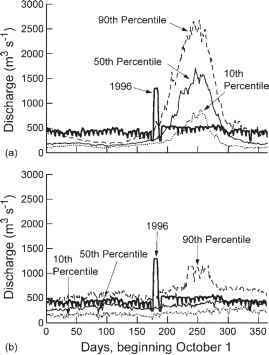 Further analysis using 420 stream gauges distributed across the coterminous United States and selected to represent minimal human modification of streamflow documented a regional clustering indicative of differences in climatic and geologic features (Poff 1996). In a separate analysis of 559 gages for the period 1941-1988, Lins (1997) identified 11 distinct regional streamflow regimes. Interestingly, these did not correspond well to the 18 hydrologic accounting units (HUCs, see Table 1.3) within the United States. 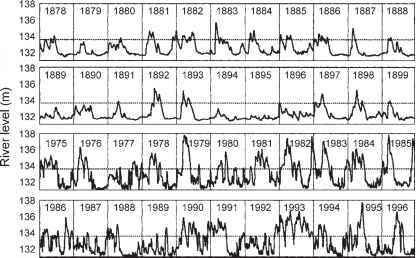 including droughts have received less attention than high-flow events and altered variability. Direct and indirect responses include dewater-ing, deterioration of water quality, loss of longitudinal connectivity, and changes to habitat and food resources (Lake 2003). Patterns in streamflow have been shown to be good indicators of biological attributes of streams. Stream fish assemblages totaling 106 species from 34 sites in Wisconsin and Minnesota were clustered into two groups based on functional traits describing their habitat, trophic, morphological, and tolerance characteristics (Poff and Allan 1995). Independent hydrological analysis of streamflow variability and predictability clearly separated the two ecologically defined fish assemblages. In support of theoretical expectations, streams with more variable flows tended to support resource generalists, and streams with more stable flows had a higher proportion of specialist species. When small streams in the Etowah River Catchment, Georgia, were separated into groups based on impervious surface and then characterized hy-drologically, increased imperviousness was correlated with several measures of "flashiness," and with decreased richness of endemic, cosmopolitan, and sensitive fish species, and decreased abundance of slow-water species (Roy et al. 2005). The extreme flow conditions associated with urbanization can have very strong effects on the biota. Degradation of macroinvertebrate communities of urban streams in and around Melbourne, Australia, was well explained by the degree of imperviousness and was especially severe where stormwater drainage systems were highly connected to stream channels, even at low urban densities (Walsh et al. 2001). 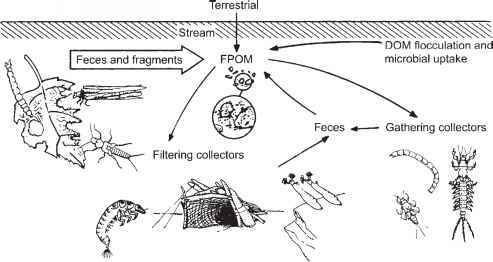 The reasons that individual species are associated with particular flow regimes obviously will be very specific, but it has been argued that four key flow-related processes underlie the decline in biological condition of flow-modified streams (Bunn and Arthington 2002). These are loss or alteration of habitat, disruption of life history processes and recruitment of young, loss of lateral and longitudinal connectivity, and greater susceptibility to invasive species. Because many organisms have specific adaptations that enable them to persist under the environmental conditions associated with specific flows, and some are adapted to exploit historical cycles of floods and droughts, changes to the predictability and variability of streamflow are likely to test the organism's adaptability and thus its ability to survive (Lytle and Poff 2004). The science of environmental flow assessment has developed in response to the recognition of the extent of flow alteration worldwide, and the need to assess ecological degradation and set acceptable levels. At present, there are many different methods to assess environmental flows as well as a wide range of flow recommendations. Consider these extremes: 10% of the mean annual flow (MAF) is used in some countries in Europe (Tharme 2003), and the need for as much as 80% of the MAF is supported by research in some rivers in Queensland, Australia (Arthington and Pusey 2003). Tharme (2003) identified some 207 methodologies for environmental flow assessment recorded from 44 countries within six world regions. Some methods are as simple as setting an annual or minimal flow volume, but increasingly a comprehensive combination of monthly and event-based (low flows and flood pulses) allocations is preferred. The most common approach is hydrological, using daily or monthly flow records and some threshold, often a minimum flow. The most widely used method worldwide, the Tennant method (Tennant 1976), uses a percentage of MAF, adjusted seasonally to recommend minimum flows. Many variants and thresholds are used (Reiser et al. 1989, Tharme 2003), some as low as 5% and 10% of MAF Exceedance percentiles based on flow duration curves are a similar approach, often applied for a daily or 7-day interval by season to set minimal flows. A more comprehensive statistical characterization of flow is captured using the indicators of hydrologic alteration (IHA) software that uses 32 different hydrologic indices derived from long-term, daily flow records and grouped into the five categories of the flow regime (Richter et al. 1996, 1997). 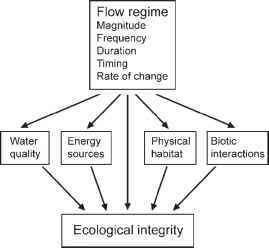 Although these methods are all intended to characterize ecologically relevant flows, evidence that these indices protect ecological attributes of streams needs to be strengthened (Tharme 2003). Another common approach, employed mainly in the northern hemisphere, uses hydrodynamic habitat modeling, usually to set a minimum flow considered sufficient to sustain target species or the entire biological community. 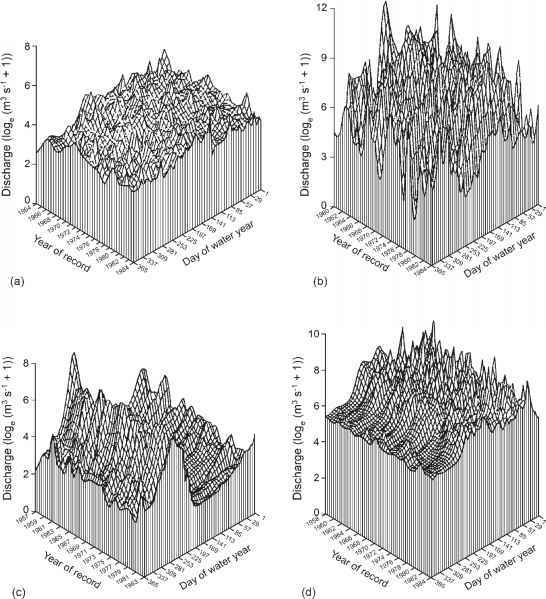 The instream flow incremental methodology (IFIM, Stalnaker and Arnette 1976) was an early example of this approach, intended to model the quantity and suitability of biological habitat using hydraulic variables such as depth, velocity, and substrate. Hydraulic and habitat simulation models then are combined to predict changes in available habitat in response to changes in flow on a species-specific basis. Tharme (2003) reports that this approach is used in at least 20 countries, despite extensive criticisms of the model approach and the often poor or untested ecological predictive capability of IFIM output. Estimating the wetted perimeter as an indication of available habitat is simpler than IFIM and is widely used (Reiser et al. 1989). The relationship between discharge and wetted perimeter is estimated, often for riffles because they tend to be areas of high macroinvertebrate production and are first to go dry. Streams in Montana showed clear breakpoints such that flows at 10% of the MAF protected about half of the maximum wetted perimeter and flows >30% of MAF protected nearly all of the maximum wetted perimeter (Tennant 1976). In an Australian application of this approach, Gippel and Stewardson (1998) showed that breakpoints sometimes are hard to identify, and questioned whether the resultant flow recommendation is sufficient for either macroinvertebrates or fish. A holistic, ecosystem approach is now at the forefront of environmental flow methodologies, drawing upon hydrological, hydraulic, and habitat analyses, and expert judgment to construct a suitable flow regime for a managed system. These are increasingly complex and interdisciplinary undertakings, allowing the evaluation of alternative scenarios, and designed with the intent to protect the river ecosystem while meeting human needs (Postel and Richter 2003) (Figure 2.17). The answer to the question, "how much water does a river need?'' is beginning to take shape. Rivers and their floodplains need most of the spatial and temporal variability of their natural flow regime to maintain their ecological integrity (Poff et al. 1997, Richter et al. 2003). More research is needed to verify the ecological outcomes of flow management scenarios, and to identify the critical thresholds for environmental flows that will ensure low risk of environmental degradation. Because the ability to connect ecological outcomes to specific flow recommendations is central to the development of environmental water requirements and their adoption by water managers, we require long-term hydro-logic experiments to fully understand the ecological consequences of various flows.